This is a Deja Review: A quick, unscored look at the new features and relative agelessness of a remade, revived or re-released game. 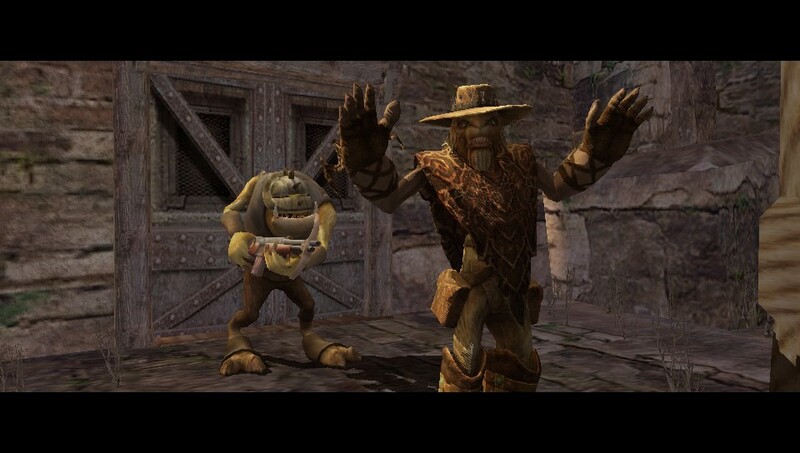 Oddworld: Stranger's Wrath has seen two re-releases since its original 2005 Xbox debut. Developer Just Add Water took on the mantle of Oddworld Inhabitant's most celebrated title, bringing out a base-level update for PC in 2010 and a fully touched up HD version on PS3 (and, again, PC) in 2011. Now Stranger's Wrath HD has been converted to PlayStation Vita and released via PSN, again with a few changes and additions to the formula – this time to suit the portable, touch-enabled console it's being housed on. Stranger's Wrath itself was one of the most-loved of Lorne Lanning and co's creations, though the sales figures behind the original left the game residing firmly in 'cult classic' status. It told the story of the eponymous Stranger – a nameless enigma making his way around an old west-styled world, trying to save enough 'moolah' to buy a life-saving operation – and with a twist that nearly made the forums of 2005 explode. In other words, perfect fodder for an inexpensive re-release and hopefully enough to guarantee greater sales thanks to the power of seven years' word-of-mouth. What's new this time around? The HD tag is something of a misnomer, with the Vita's screen incapable of the requisite resolution to be classed as HD. Even so, the original Stranger's Wrath assets have been remade specially for a 720p output and they do still look fantastic at times, with lush scenery and enough spit and polish to keep everything looking fresh. There's the strange glitch here and there, like the flickering colors of the skyline, but most of the time it's a great looking affair – thanks in no small part to its timeless, imaginative and inventive character design. It's good to know we'll be seeing new games from the Oddworld universe for this very reason. There's also remastered sound, which is generally good quality (there's a muffled voice here and there) and of course there's what you would expect in the shape of touchscreen controls to cater to Stranger's arrival on Vita. One issue with throwing in obligatory touch-based functions is that things can go wrong. 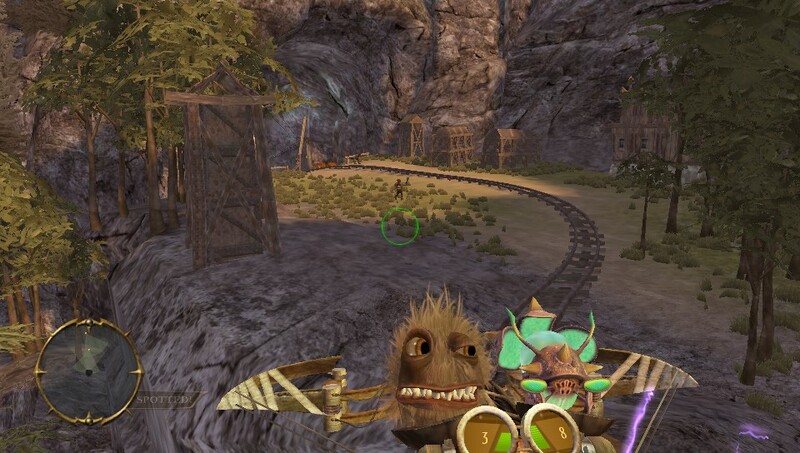 By no means has Stranger's Wrath been broken, but there is an irritating issue present with the use of the Vita's rear touchpad, which acts as a punch button while in first-person perspective. The idea works well on paper, but in actual use it tends to be a Random Punch Generator, making Stranger swing wildly any time you slightly adjust the grip on your console. This oversensitive input, while certainly annoying, isn't enough to make the Vita-specific control set a total bust. When it comes to the other touchscreen features, they're sensible and functional – albeit not exactly a revelation. Double-tapping the screen to switch between first and third-person viewpoints makes total sense and becomes second nature within minutes, for example, but the unique features don't go much further than that. Oddly (ho ho! ), one of the greatest things the Vita brings to Stranger's Wrath isn't even a specific Just Add Water extra: it's the handheld's built-in sleep feature. Judicious use of the function manages to change the entire make-up of the game, allowing you to play through individual, small skirmishes whenever you feel like it. Yes, a save function has always been present on the console and computer versions, but the speed at which you can pick up the Vita, wake the console up and carry on with the campaign really does make Stranger's Wrath feel like a different game – it's far more suited to the world of handheld gaming than I might have initially thought. How's it hold up? 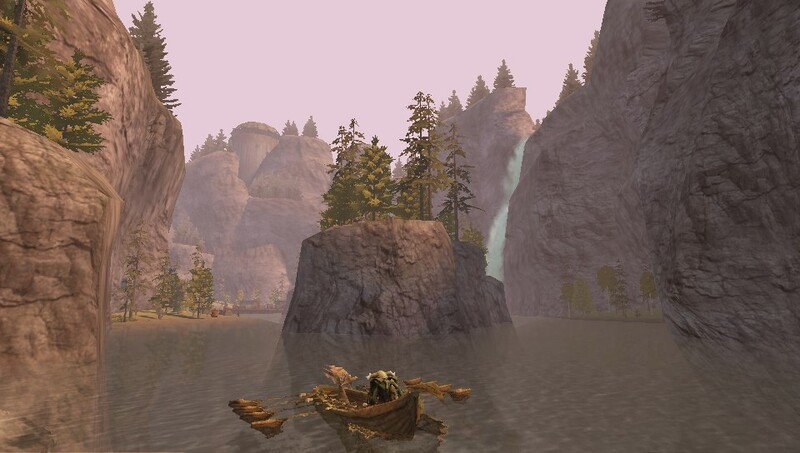 The game itself was, back in the day, a unique hybrid of third-person platform-adventuring and first-person shooting (with elements of stealth, naturally). Playing it again seven years later, it's still just as unique. Players are free to switch between perspectives at any time, and while you can't approach every situation in a single perspective – there are times you simply have to use one or the other – it's surprisingly open to individualistic approaches. But what are you doing with said individualistic approaches? Fair question. Stranger's Wrath sees players tackling a series of bounty hunts. Each bounty works out as a level, with the general setup being to take on a few dozen henchmen – killing or capturing them as you see fit – and facing off against the bounty target itself in a boss fight, again allowing you to kill or capture the final foe. Kill your targets – the easier way to do things – and you'll end up with less "moolah" than if you capture. As things progress, however, capturing enemies becomes extremely difficult and requires a fair whack of strategy on top of the usual manual dexterity. This strategy presents itself mainly through Stranger's Wrath's living ammunition system – eight different creatures to shoot at enemies, all with different effects. Machine gun-style Stingbees, landmines in the shape of Fuzzles or direct-fire irritants in the shape of Chippunks can all be used in a variety of different ways to take down enemies. Clever mixes of all types of ammo are required to take later bounties alive – sometimes even dead, such is the difficulty of certain encounters. But Stranger's Wrath isn't a game that has aged perfectly. Imbalanced elements and unfair, unexpected difficulty spikes tarnish the experience. Encountering a boss who can take down a fully decked-out Stranger in just a few (quick-hitting, never-missing) shots isn't exactly an exercise in fairness or balance. When it happens more than once, frustration sets in. Then there's the feeling of padding: one that isn't hugely apparent until you realize there's a story waiting to kick into another gear for around half the time you're playing it. It's not a deal-breaker by any means, but the eight-or-so hours it takes to finish Stranger's Wrath is a fair few hours longer than what I feel it should last. For all the modern day complaints over five-hour campaigns, here it feels like it would suit the situation. But there's still a lot of good in Stranger's Wrath HD. Tying up a couple of enemies with bolomites before thudslugging another off a nearby cliff is always entertaining. The ability to switch quickly and easily between ammunition types, combining them to deadly (or less-than-deadly) effect never gets old. And I really can't say enough good about the imagination on display. There's a reason the twist was so popular with players the first time around: it's a twist you care about, in a world you care about, with characters you care about. The combination of it still being a truly unique experience and offering some welcome improvements help Stranger's Wrath to stand out, even all these years later. If you missed out – or chose to avoid – the PS3 and PC re-releases, the Vita version is the best one out there (ignoring the rear screen punching issues, admittedly). Portability and the handheld's fantastic sleep function breathe new life into a game that, while showing its age in some irritating ways, is still fun to play. For a low price you're getting what still remains a captivating and inventive experience: exactly the sort of game we should be encouraging in these days of homogenization. This review is based on a PSN download of Oddworld: Stranger's Wrath HD for PlayStation Vita, provided by Just Add Water. Ian Dransfield is a British writer, classically trained in both journalism and sarcasm. He has written for plenty of print and online publications including Play, GamesTM and PC Gamer. You can follow him on Twitter @ianinthefuture, if you don't mind all the swearing.